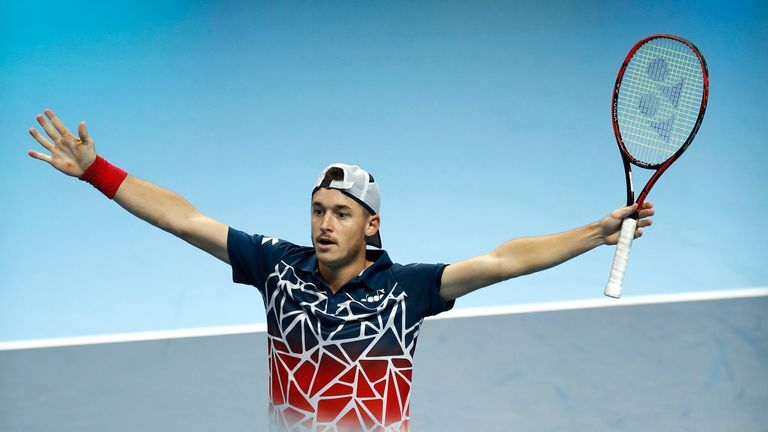 Stefanos Tsitsipas won the battle of the big guns as the Greek superstar proved too good for Frances Tiafoe to stay unbeaten at the ATP Next Gen Finals in Milan. The 20-year-old was always in control against his American opponent and fired down 21 winners to come through 4-3 (7-3) 4-3 (7-5) 4-2 and take control of Group A thanks to his second win in as many matches. "I never dropped my performance, I always stayed at 100 per cent almost, so (I am) very satisfied that I managed to stay calm and play every point like a match point," Tsitsipas said. "Hopefully I can play like this in every match that I'll be playing here at the Next Gen ATP Finals." Earlier in the same group, Polish No 1 Hubert Hurkacz battled to victory against Jaume Munar of Spain 4-2 4-2 2-4 3-4 (5-7) 4-1 to move to 1-1. Hurkacz will face top seed Tsitsipas on Thursday in the final day of round-robin action, while Tiafoe will take on Munar. In Group B, Italian wild card Liam Caruana may have produced a moment of magic by winning one of the points of the season, but he went down to a 1-4 4-1 4-3 (11-9) 4-2 defeat to Taylor Fritz. Australian starlet Alex De Minaur remained perfect in the group after seeing off Andrey Rublev of Russia, 4-1 3-4 (5-7) 4-1 4-2. Rublev faces Caruana before second seed De Minaur tackles Fritz in the final round-robin matches.